Heading into town I saw this in my rear view mirror heading into Nibley Utah. Did a U-turn and caught this just in time. 15 more seconds and it was gone. Incredible! At what focal length and aperture did you shoot this? I guess your aperture may have changed as you bracketed...? Or is this a single exposure? Really a beautiful image. 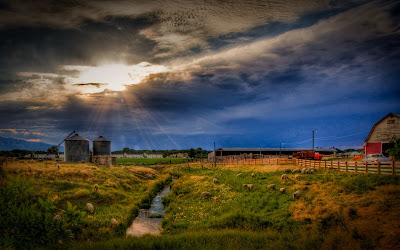 Great HDR Mel! I really love how HDR helps accentuate sun-rays! I love the composition and feel that the vignette really helps make the scene. I am wondering if you have ever tried running noiseware on your finished HDRs? ... It seems like then end up a bit grainy, and sometimes I have found the de-noising helps... (I noticed it mostly in the blue sky by the barn...) Just a thought. Anyways, great shot, I'm glad you caught the awesome light and great scene! I love this picture!! Way to seize the moment!